The BBC’s More or Less recently drew attention to an interesting case of shaping reality. During November and December, the housing and homelessness charity Shelter ran a campaign claiming that 80,000 children would be homeless in the UK for Christmas. 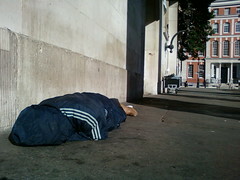 This surprised a lot of people, including the More or Less team, as it is very rare to see a child sleeping rough in British cities. In fact, this isn’t what Shelter meant. The 80,000 figure, which derives from government estimates, referred to the number of children belonging to families without their own home and therefore dependent on temporary accommodation arranged by the local authority. Many of these families are lodged in B&Bs, paid for by the council. Almost no family with children will be denied a roof over their heads at any time of the year, let alone in winter. An anonymous B&B is hardly a great place for any child to spend Christmas, but this reality is a long way from the freezing park bench people might have imagined when hearing that homelessness prediction. Was the campaign justified? Many of us automatically take “homeless” to mean living on the streets; we wouldn’t be thinking of carpeted bedrooms, fried breakfasts and hot showers as, horrified by the headline, we reached into our pockets. Yet a B&B is not a home, and therefore, technically, these kids are “homeless”. Shelter is being truthful in its assertion… even if a tiny bit misleading.